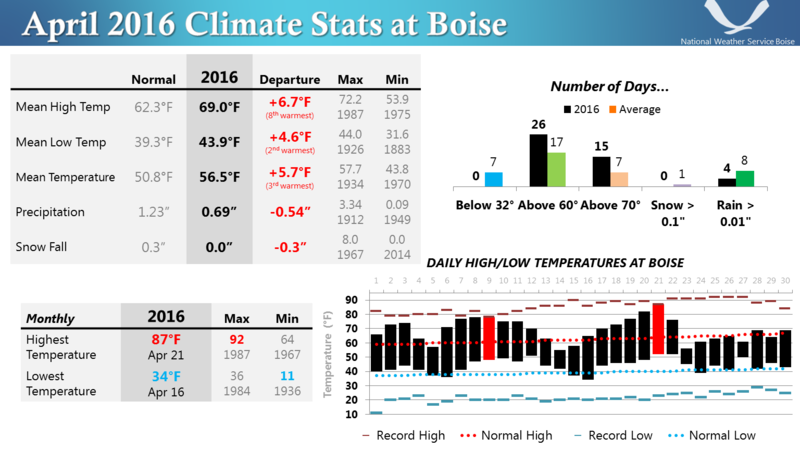 April 2016 was the warmest April ever recorded at the airport and it tied for 3rd warmest since temperature recording began in the Boise area in 1864. It was the 5th consecutive warmer than normal month. A warm upper level high pressure ridge, which dominated the Inter-mountain West during the first three weeks of the month, was responsible for the record warmth. Relatively weak Pacific weather systems interrupted the ridge a couple of times, on the 4th and 5th and the 14th and 15th, briefly lowering temperatures to a few degrees below normal. Northwest winds accompanied the cooler air, gusting to 36 mph on the 4th and 37 mph on the 15th. Only light amounts of rain fell. A strong and wet upper level trough plowed into the ridge on the 22nd and passed directly over Boise on the 23rd, dumping nearly half an inch of rain at the airport, and up to twice that amount at a few Treasure Valley locations west of Boise. This system ushered in a pattern change, with westerly flow aloft splitting over the Northwest coast, and a cool upper level trough expanding over the Western United States, lowering temperatures in our area to near normal. There was no measurable rain at Boise after the 23rd, as most precipitation was either deflected south to California and the Desert Southwest, or confined north and east of Boise. Following a cold front on the 25th, Northwest winds gusted to 45 mph at the airport. The 28th through the 30th were not quite that windy, but gusts exceeded 30 mph each day.